Today our group visited Soweto, S. Africa where the student uprising to end apartheid began. A very sad story, that led to the death of over 800, but one that brought eventual freedom and equality for black South Africans. Where was I in 1976 when this happened? I was in my little American bubble. Unless we are intentional, we can be very insulated from world events. Once again, God has challenged me to read world events to stay aware of the things God is doing in His world. Thank you, World Outreach Team, for keeping the world on our radar! I’m going to read “Long Walk to Freedom” by Nelson Mandela. Please pray for me as I preach tomorrow at church. Joe for the Fab Four. It’s been a wonderful day in Johannesburg. Our team attended church with the Kraybills at Grace Baptist Church. It’s a smaller congregation with a big heart for others. 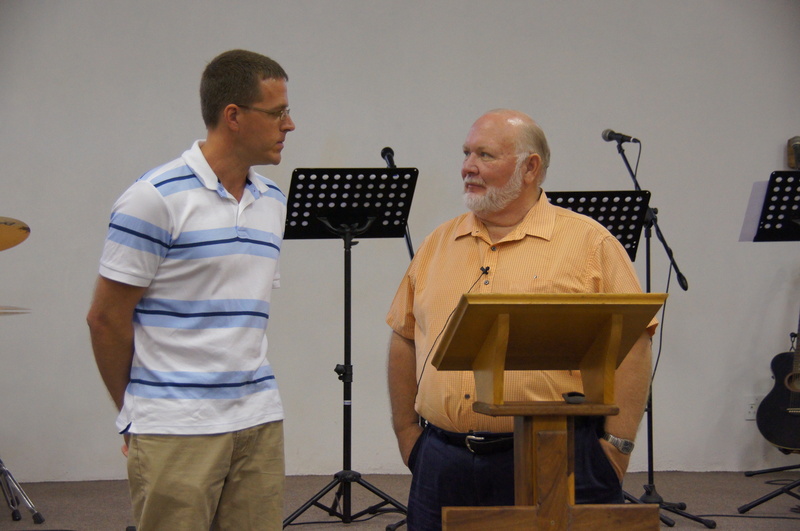 Rod introduced Pastor Joe to the congregation, who challenged the church with a message from Acts 2. 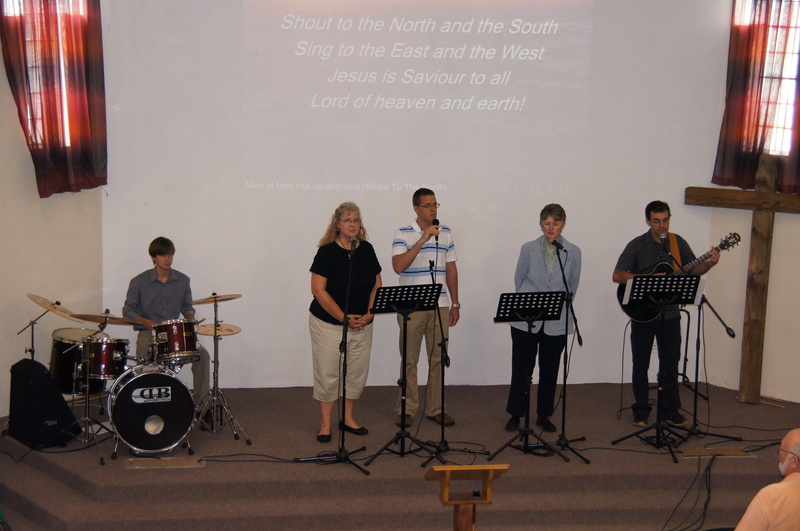 I was invited to join the worship team as a vocalist. After service we attended a luncheon sponsored by the Caring Ministry (Lori is one of the leaders). This ministry does outreach by giving food parcels & donated clothing to those who have come to South Africa seeking a better life but are still struggling. 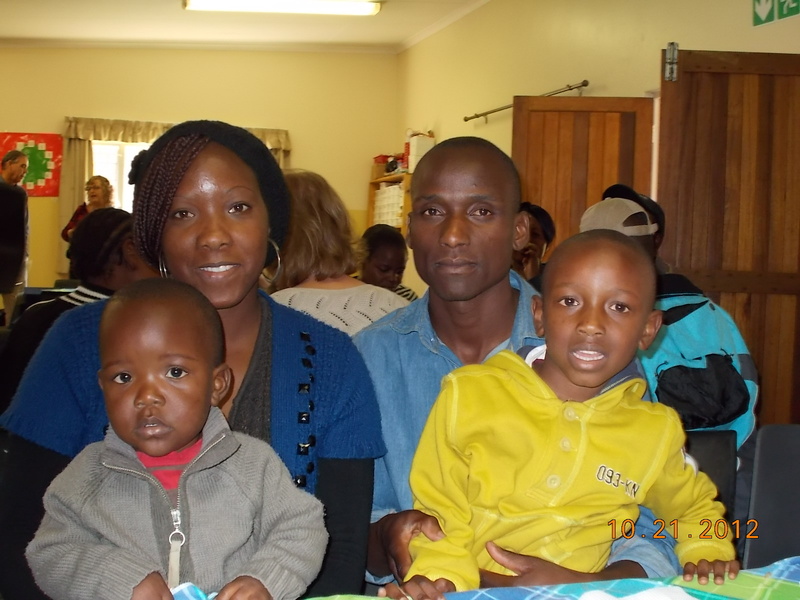 I met the Mabee family who have emigrated from Zimbabwe. He is a trained security officer but has not found a job in this field, and he is supporting his wife and 2 sons, ages 6 and 2, by doing odd jobs. 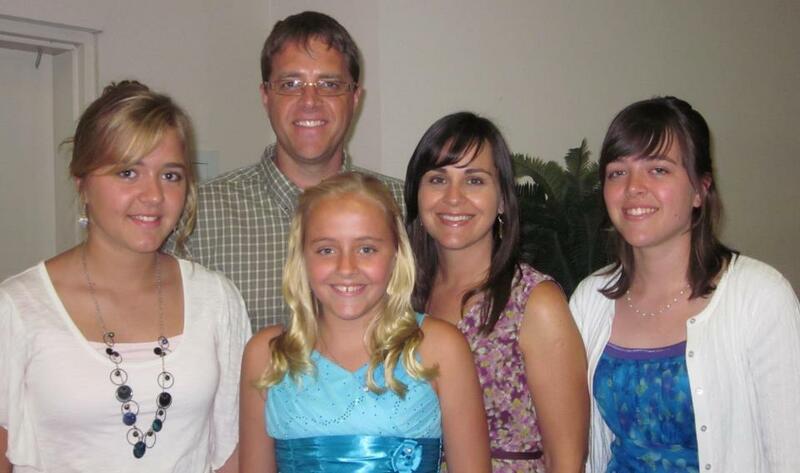 This family has been blessed by the gifts of the Caring Ministry. It was a joy to hear their story and realize how the church is ministering to them. Thank you for your prayers for our team and our time with Rod and Lori. We’ve gotten to know them on a deeper level and learn more specifics of how God is using them in missions. Every Friday, we’re taking a peek at how God is working in the lives of our impact students. These servants of Jesus are walking daily by faith as they navigate the hallways and relationships inside their school walls and beyond. Our weekly series will highlight what God is up to in their lives in their voices. Leave them some encouragement by commenting? Hi everyone, Gracie Adamek here! I was asked to write about my recent experience at the ONE retreat that the youth group just went on. Basically what happened was I was sitting in the chapel session, listening to the speaker, Zane Black, talk about going all in for Christ and reaching out to at least one person by the following Wednesday. Zane asked us to close our eyes and pray about who God wanted us to reach out to. A few names went through my mind and then all of the sudden, it was like I was literally hit by my friend Peggy’s name. That’s honestly the only way I can explain it. I knew I had to talk to her about God more than I already had. See, Peggy has been coming to iMPACT since about halfway through last school year but is not a Christian. As I was sitting there, I was overcome with this conviction, stronger than I had ever felt before, that I had to call her that night. I was sobbing and shaking so hard that I had to go to the bathroom and calm down. Before going to call her, I prayed with a leader, Josh Peterson, one of my best friends, Abbie, and I asked several people to pray for me as well. I felt very covered in prayer, for sure! Abbie and I skipped the game we were supposed to be playing and went into a room away from things so I could collect myself and dial the phone. And God took it from there! I also remember her saying that she wants to believe so badly, but just can’t yet. I told her about how I wouldn’t give up on her and I told her about the peace and love she will feel when she accepts Jesus. I know she will! I can feel it. I can see the Holy Spirit working in her even if she can’t! Abbie, Peggy and I were crying our eyes out the whole time, and Peggy thanked me for calling, and she said she felt very loved. I made sure she knew that it was all because of God that I called her. So, like I said, I wont give up. I just can’t go to Heaven without her. Today I am sitting with our missionaries, Rod and Lori Kraybill, in South Africa. are making us feel very at home here with their generous hospitality. I’m here with three others from our church- Deb Boerman, Michael Matteoni and Beth Marshall, and we came with gifts for the Krabills given by some of their friends at Immanuel. It was a joy watching them unwrap the what was given. Five years ago, God called Rod & Lori to a new place of service in the world — Johannesburg, S. Africa — where they needed to find a new place to live, make new friends and establish a whole new network of relationships. This they did obediently as they responded to God’s movement in their lives. We are here to see and experience their life and ministry and to encourage them any way we can. Fresh from South Africa! from Immanuel Church on Vimeo. The scene — it’s just before the Feast of the Passover, and Jesus knows the hour of His death is near. Many of us want to walk in obedience and serve in the very generous, very humble way Jesus demonstrated, but we don’t often know where to begin. And perhaps that’s where Immanuel Church Unleashed day comes in. Designed to help our body be the Body, our church be the Church, this day of service is aiming to center around coming together to help those in our community who need help. Our teams will arrive and then mobilize to help with simple house cleaning, minor home repairs (bring your toolbox! ), build bunk beds, wash windows, pick up trash around the neighborhoods and deliver blankets to nursing home residents. If God has been stirring in your heart a desire to live and serve generously, ICU day might be just exactly where He’s calling your heart, time and mind this weekend.